The Cassini spacecraft has captured the closest ever view of Saturn’s small, ‘wavemaker,’ moon, Daphnis, allowing astronomers to observe new details up close. The image is the latest in a series of spectacular pictures of Saturn’s rings and moons sent back by the spacecraft. 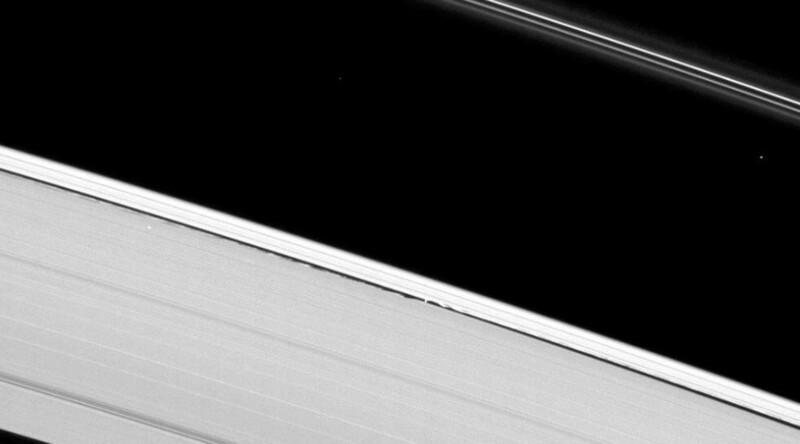 Daphnis is about five miles (8 kilometres) in diameter and orbits Saturn in the 26-mile (42-kilometer) wide Keeler Gap within the A ring - the outermost of the large bright rings. In this image, taken by the Cassini narrow-angle camera, however, the gap appears smaller due to the spacecraft’s viewing angle. The close up photo shows waves on the edges of the gap in both horizontal and vertical directions. These are caused by the moon’s gravity. 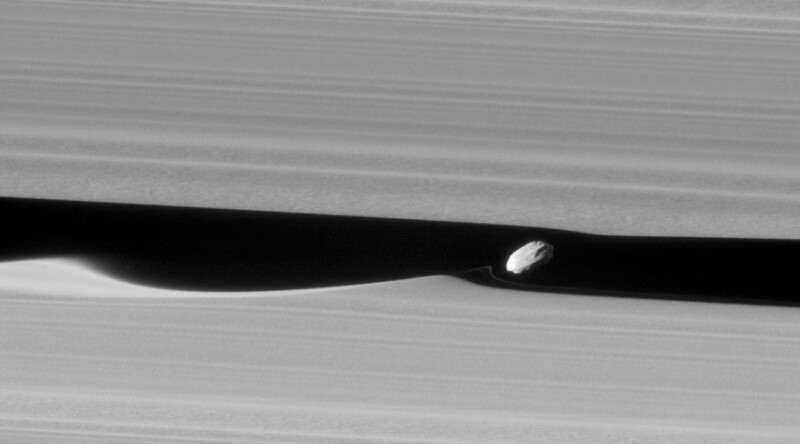 Daphnis was first identified by the Cassini Imaging Science Team in 2005. In 2009, the Cassini observed only vertical structures during Saturn’s equinox in a photo taken at a distance of 1.3 million kilometres (808,000 miles) from the tiny moon. This latest image was taken in the visible (green) spectrum of light at a distance of approximately 28,000 kilometers (17,000 miles) from the moon. This up close and personal snap, taken on January 16, allowed astronomers to observe a narrow ridge around its equator, as well as a number of craters and some fine details within the rings themselves. Another ridge can be seen further north parallel to the equatorial band, according to a statement released by NASA. NASA scientists noted that the wave peak in the gap’s edge on the left has a much softer appearance than the otherwise sharp edges of the Keeler Gap. “This is possibly due to the movement of fine ring particles being spread out into the gap following Daphnis' last close approach to that edge on a previous orbit,” NASA said. A faint swirl of ring material trailing the left-hand side of Daphnis is also visible in the picture and can be likely attributed to the moment the moon unleashed a packet of material which then spread out, according to NASA. Cassini has treated us to an array of awe-inspiring images since it started orbiting Saturn in 2004, including a selection of the planet’s 62 confirmed moons. In December, NASA’s Cassini spacecraft made its first dive past one of Saturn’s outer rings, beginning the final chapter of its mission which comes to a fiery end on September 15 when the craft will plunge into the gas giant’s upper atmosphere and burn up on descent.